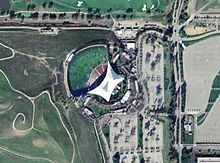 Shoreline Amphitheatre is an outdoor amphitheater located in Mountain View, California, in the San Francisco Bay Area. The venue has a capacity of 22,500, with 6,500 reserved seats and 16,000 general admission on the lawn. When the parking lot is utilized for festival stages, the total capacity of the venue can reach 30,000. Aerial photograph of Shoreline Amphitheatre, with the parking lots and the neighboring golf course. 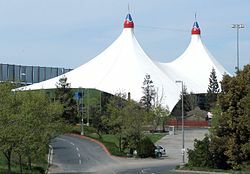 The amphitheatre was built in 1985-1986 by the city of Mountain View, in cooperation with local promoter Bill Graham, as part of the Shoreline Park project. Graham designed the amphitheatre to resemble The Grateful Dead's "steal your face" logo. The premiere season was during the summer of 1986, it was planned to open with a concert by The Grateful Dead, who had to cancel as a result of Jerry Garcia's coma. The first performance at the amphitheater was comedienne Rosanne Barr, opening for Julio Iglesias on June 29, 1986. On August 22, 1986, a concert by Jackson Browne was recorded by Westwood One for their "Superstars" concert series. Anderson Bruford Wakeman Howe performed on September 9, 1989, the show was recorded for broadcast by the King Biscuit Flower Hour and was later released as a live album, titled An Evening of Yes Music Plus. The Dave Matthews Band performed during their Crash Tour on July 6, 1997, the show was recorded and released as a live album, titled Live Trax Vol. 17. The amphitheatre has played host to many music festivals, including All That! Music and More Festival, Anger Management Tour, Area Festival, BeachFest, Bridge School Benefit, Country Throwdown Tour, Crüe Fest, Crüe Fest 2, Download Festival, Family Values Tour, FoolFest, Furthur Festival, A Gathering of the Tribes Festival, H.O.R.D.E. Festival, Harmony By the Bay Festival, Honda Civic Tour, Identity Festival, I Love This City Festival, KITS Live 105's BFD, KOME X-Fest, Lilith Fair, Lollapalooza, Mayhem Festival, Ozzfest, Projekt Revolution, Rock the Bells Festival, Sprite Liquid Mix Tour, Uproar Festival and Vans Warped Tour. It has also been the venue for the Google I/O annual developer conference for the years 2016, 2017, and 2018. In its opening year, a fan attending a Steve Winwood concert flicked a cigarette lighter and ignited methane that had been leaking from a landfill beneath the theatre. Several small fires were reported that season. After those incidents, the city of Mountain View commissioned methane testing studies to define the location of methane vapors emanating from the soil within the amphitheater. These tests were used in developing a design for improved methane monitoring and more efficient methane extraction to ensure the amphitheater became safe as an outdoor venue. Ultimately, the lawn was removed, a gas barrier and methane removal equipment were installed, and then the lawn was re-installed. ^ Vaziri, Aidin (May 27, 2011). "25 years, 25 fabulous Shoreline Amphitheatre facts". SFGate. Retrieved July 31, 2016. ^ "What to expect from Google I/O 2018". MobileSyrup. May 3, 2018. Retrieved May 4, 2018. "Shoreline Ampitheatre is a "Steal Your Face"". Dead.net. Retrieved 30 July 2016.